0-60 in 5 Seconds …without a trailer 20 Seconds with a 80,000 lbs payload! Single seat cabin ... who needs a driver anyways. Enhanced autopilot features Automatic emergency braking, automatic lane keeping, and lane departure warning. We watch a lot of vehicle debuts around here, but very few of them are as interesting as what we saw last night in Hawthorne, California. 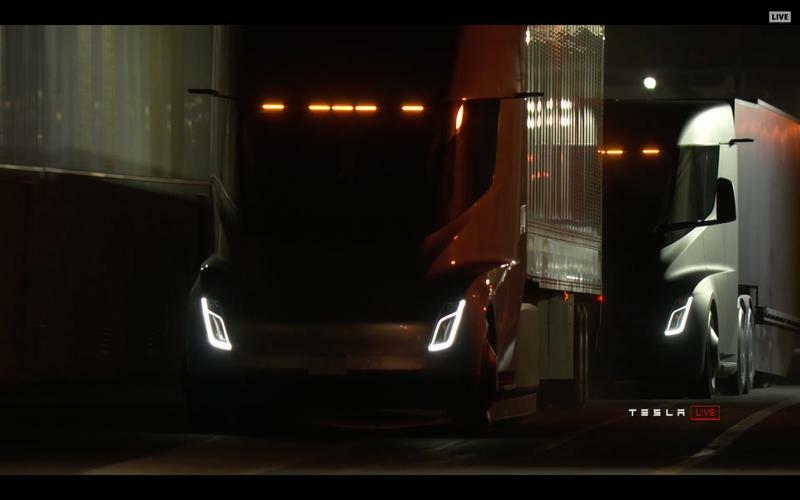 Kicking it off was Tesla’s new semi truck, an all-electric solution to moving freight from A to B. Per usual, Elon Musk took center stage, giving all in attendance (not to mention all those watching online) the lowdown. Expectations were high, no doubt, but the specs speak for themselves – the speed, range, and safety systems aim to once again completely change the way we see all-electric motivation. 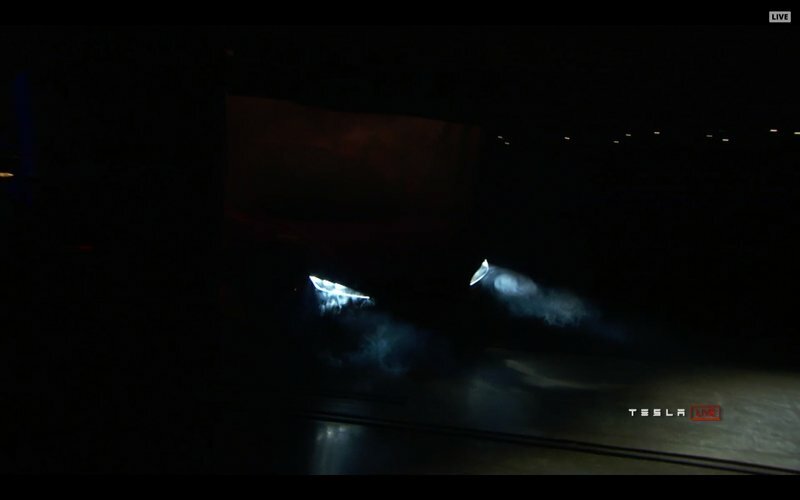 If that wasn’t enough, the end of the presentation brought something even more exciting – the new Tesla Roadster 2.0. The numbers on this thing are even more insane, looking to push the world of sports cars (all sports cars, not just those with battery power) into uncharted performance territory. All told, it was a whirlwind event, filled to the brim with details you might have missed. Fear not, because we’ve got them all right here in the following analysis. The whole event was almost an hour and a half long, with plenty of hoopla and applause from the Tesla faithful in the audience. However, that energy was infectious, and it was easy to get swept up in the moment. But today is a new day, and we’ll take a more sober look at what was actually revealed last night. Helping us along is a video put together by our good friends at The Verge, who managed to condense it all down to nine minutes. Read on for the details. Continue reading to learn more about last night’s Tesla debut event. After a lengthy delay, the debut event finally kicked off around 8:30 PM Pacific. As soon as it started, we got a good look at the semis, one of which was finished in silver, the other in flat black. Each rolled onto stage amidst thunderous applause, which got kicked up a notch when Tesla CEO Elon Musk climbed down from the cabin. 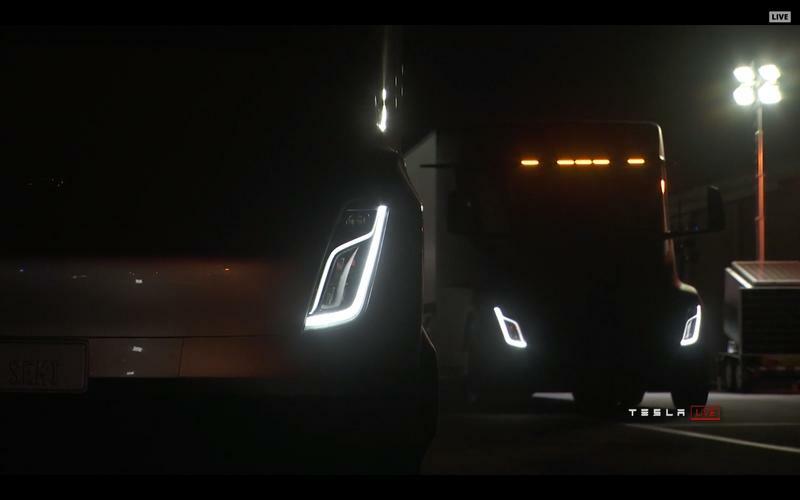 Right away, the semi’s styling and aesthetic reminded us of the Model X. The broad, flat, uncluttered surfaces formed a prominent beak that cuts through the air with minimal drag. The fascia goes without a grille, enhancing aero efficiency even further. The headlights are mounted low, and use LEDs for the forward projection and daytime running lights. After the introductions, Musk jumps right into the truck’s acceleration and range specs, giving us yet another fun little Tesla-ism right off the bat – BAMF Performance. 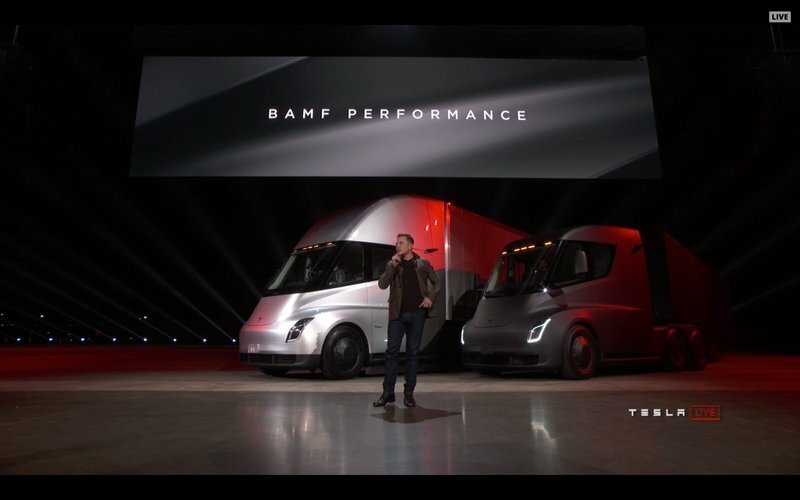 Like a semi-flavored Ludicrous mode, BAMF Performance means the Tesla semi trounces traditional diesel trucks in terms of acceleration, reaching 60 mph in just five seconds without a trailer. That’s sports car territory, and as Musk points out, a traditional semi takes roughly 3 times as long to complete the same test. Of course, that muscle translates into astounding performance with a trailer as well. At 80,000 pounds max gross vehicle weight, the Tesla takes just 20 seconds to hit 60 mph, while diesels take a minute on average. Then there’s the way this thing climbs hills. 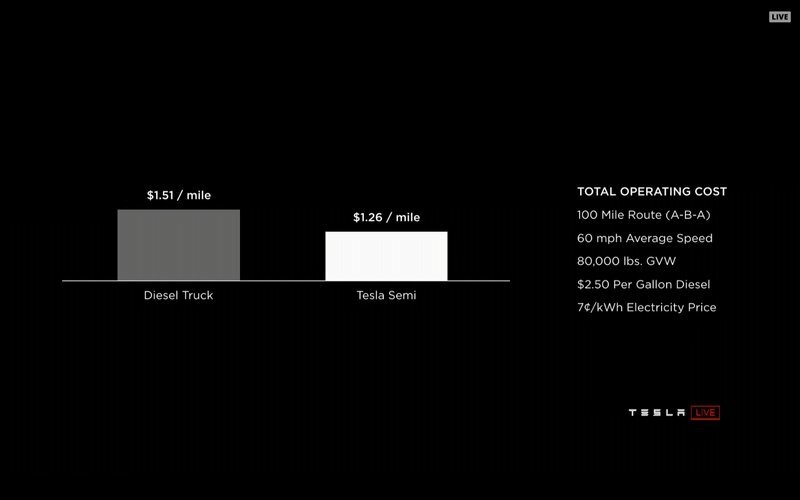 On a 5-percent grade carrying max load, the Tesla semi can maintain a steady 65 mph, while diesels top out at roughly 45 mph. Of course, speed in a semi isn’t necessarily about bragging rights. If you can go faster up a hill, you’ll be able to get to your destination more quickly, and that means higher profits. It’s also a safety issue. Maintaining the same speed as the traffic around you means you’re less likely to have a collision, which complements Tesla’s stated goal of making driving less dangerous for everyone on the road. So far, so good. While many of these numbers seem overly optimistic, Tesla isn’t known for missing the mark in terms of acceleration and speed predictions. Rest assured – these are some truly BAMF trucks. But What About The Range? While a fast 0-to-60 mph time is impressive, a semi isn’t made for the track – it’s made to go the distance. Range-per-charge is a major issue when discussing any all-electric vehicle, but it’s doubly important in a semi, so how does the Tesla stack up? Initial estimates pointed to 300 miles between plug-ins, which is decent, but not really all that threatening to the diesel status quo. Impressively, Tesla says its semi can go 500 miles at highway speeds with a full load. That makes this thing a very real alternative to dino juice. At 65 mph, you’re looking at about 7.7 hours of continuous driving before the batteries go flat, which is about right for the average driver. Add in the fact that, unlike a diesel, you don’t have to keep the engine running during weigh-ins and inspections, and Tesla nailed it in this respect. Of course, it’s worth mentioning that although Tesla doesn’t make a habit of pumping up its range estimates, those 500 miles are based on a series of averages that might not pan out exactly how you expect in the real world. For example, if you’re hauling up a hill at 65 mph, odds are you’re draining the battery pack pretty quick, and a miscalculation might result in some serious delays while you find the nearest plug. Providing motivation is a quartet of independent electric motors, one for each of the rear wheels. Independent suspension keeps it comfortable. To top off the batteries, Tesla introduced a new Megacharger system, which is similar to its Supercharger network, but designed for fleet trucks, providing as much as 400 miles of range in just 30 minutes. Powered by solar energy, Tesla says its Megacharger network will eventually go worldwide, and have guaranteed low rates for electricity. It’s an ambitious idea, but about par for the course for Tesla. Details on the Megachargers are few and far between, but for electric semis to become truly mainstream, it’s an absolutely necessary step. Of course, this raises questions of when autonomous systems will replace human truck drivers outright. The Tesla semi is certainly a step in that direction, but for now, human pilots are still irreplaceable. The technology will eventually get there, but the Tesla semi won’t do it overnight. Further safety enhancements include low rollover risk with the truck’s low center of gravity (the batteries are mounted close to the ground), as well as jackknifing mitigation thanks to individual torque application with the electric motors. This should come as great news for drivers, as preventative technologies like this will help to eliminate potential disasters. 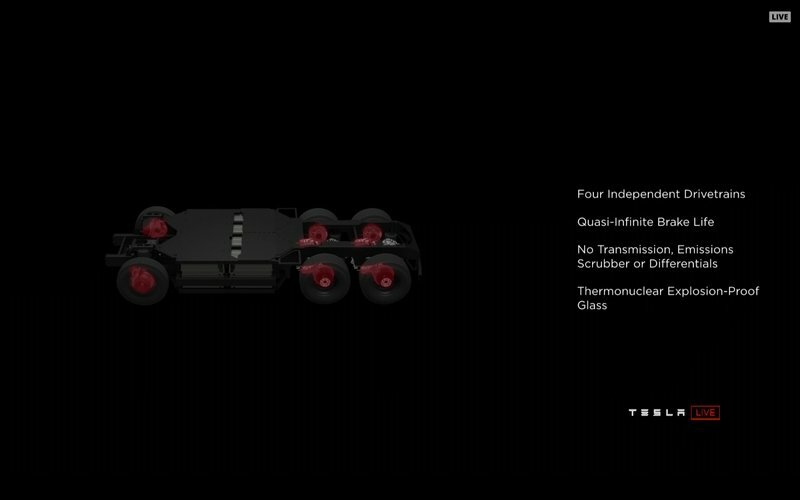 Thanks to the fact its got so few moving parts, Tesla is promising its semi will be able to go a million miles before experiencing a break down. 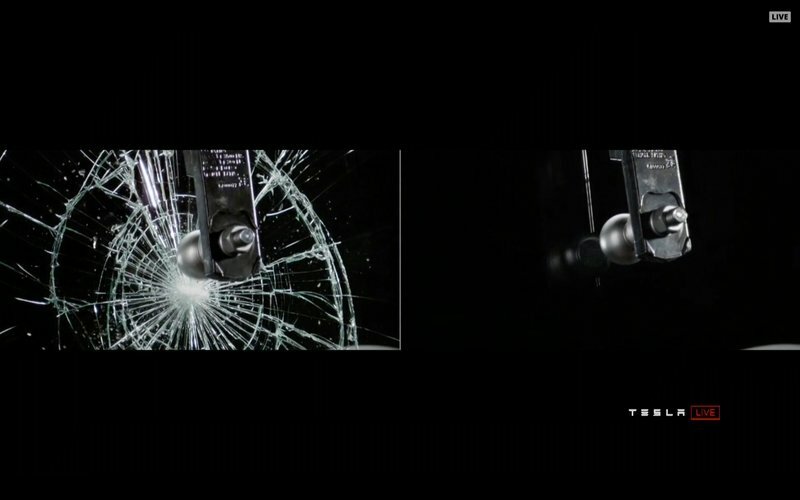 The windshield was also made to be highly crack resistant – so much so, Tesla is calling it “thermonuclear explosion proof.” What’s more, the brakes, typically a high-wear item in a semi, provide energy reclamation that actually juices the battery, enhancing range and providing virtually “infinite” brake life. If your semi does need repair, the onboard diagnostics will alert you as such. The whole system integrates with a broader range of systems that includes navigation and fleet management. Impressive, no doubt, but the inevitable question is this – what’s it cost? Well, Tesla ran the numbers, and calculated that its semi was actually $0.25 cents per mile cheaper than a traditional semi. Again, that takes into account a variety of factors and averages and might not translate exactly as such in the real world. Odds are we’ll find the true operating costs when the first Tesla semis hit the road, but this estimate, even if it is a bit optimistic, is hugely important for the semi’s success. After all, this isn’t a Model S – no one is gonna buy one to look good at a party or impress a cute barista who says she’s into saving the environment. At the end of the day, cutting emissions and increasing safety are important, but these machines are for working. They have to make economic sense. If they really do save as much money as Tesla boasts, then success is pretty much guaranteed. But Wait, What’s That Lurking In The Shadows? In a surprise move, a slinky red sports car emerged from one of the semi’s storage containers, LED lights glowing, tires spinning in an endless wave of torque. Say hello to the Tesla Roadster 2.0. It’s a brilliant bit of marketing on Tesla’s part – show the semi, lay out the cost savings and safety stuff, then bam – hit ‘em with the sports car. We were immediately smitten by the way this thing looks. It looks the part of a Tesla supercar, with ultra-low proportions, wide hips, and plenty of speedy curves. However, the real story on this thing are the speed specs, which are absolutely stratospheric – 0-to-60 mph in 1.9 seconds, 0-to-100 mph in 4.2 seconds, quarter mile in 8.9 seconds, and a top speed of 250 mph. Torque is rated at 10,000 Nm. Face melted. Face melted. This is Tesla in ultimate mode. Then there’s the range – 620 miles between plug-ins on the highway, blowing away all challengers. It’s also got a 2+2 seating arrangement and unspecified amount of “capacious” cargo room, making it relatively practical for a supercar. This is Tesla in ultimate mode. 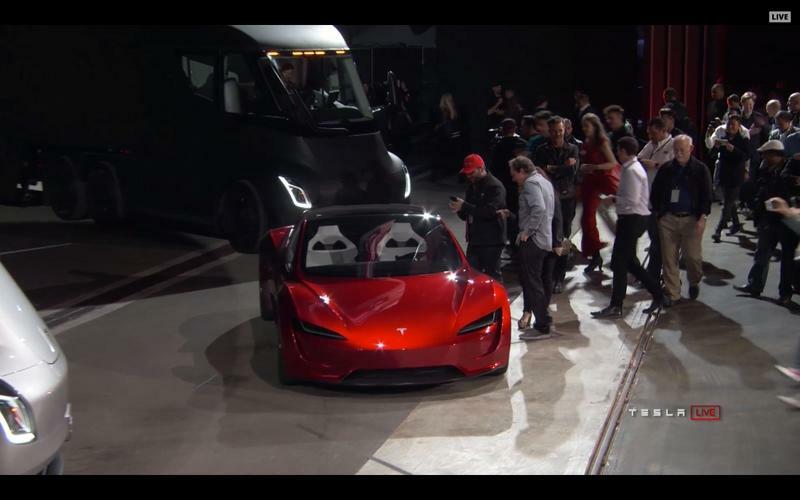 Unfortunately, the Roadster 2.0 is also at least three years away, and costs a minimum of $200,000. Those interested in the first-run “Founder” series will need to plunk down $250,000 up front to reserve theirs. As Tesla struggles to meet demand for the Model 3, something like this might seem overly ambitious, especially alongside a new electric semi and plans to create a new Megacharger network. But that’s Tesla’s in a nutshell, really – bite off more than you can chew, worry about the details later. On their own, the specs on the Roadster 2.0 are surely enough to get every one of the traditional carmakers out there to stand up and take notice, so in that respect, Tesla has already won. Last night was filled with huge promises. Both vehicles that debuted are absolute game-changers in their own right. But the question remains – can Tesla deliver amidst swirling controversy and challenging growth curves? In the end, it might not even matter. Between the excitement generated by events like last night’s debut and the cult of personality around Musk himself, it’s tough to take the wind out of Tesla’s sails.